Home » What is Thermowell and How-to choose Thermowell Probe Length ? The American Society for Testing and Materials (ASTM) has defined the term Thermowell as ” a closed end re-entrant tube designed for insertion of temperature sensing element, and provided with means for a pressure tight attachment to a vessel”. Thermowells are hollow tubes closed off on one end and threaded at the other end. They are permanently placed into pipes, tanks or sumps so that temperature measurement probes can be inserted into the pipe to measure the contents temperature. Also it is an enclosure used to protect a temperature sensor probe (RTD or thermocouple) from exposure to hazardous materials or extreme environments. Selection of thermowell material depends upon the process conditions such as corrosive liquids of the measurement. For low pressure and temperature applications Teflon may be used. This is the inside diameter of the Thermowell. Total length of the bore. 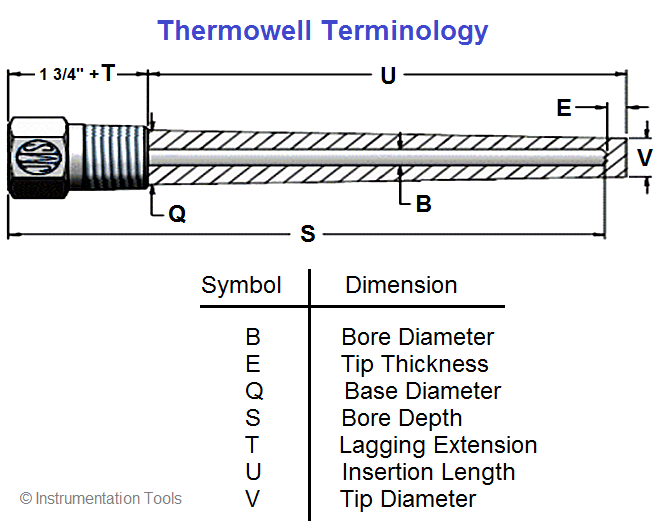 Thermowell immersion lengths are often called the “U” length which is the measurement of the Thermowell from the bottom of the process connection to the top portion of the Thermowell. This is the manner in which a Thermowell is inserted and connected into a process referring to the attachment of the element. The most popular are threaded, socket weld, and flanged connections. This is immersion portion (shank) of the construction. The majority fall under three categories: straight, step or tapered. The straight shank is the same size all along the immersion length. For general purpose, where additional strength is not required, the straight shank or stem is used. The step shank has a larger outer diameter at the end of the immersion length in some applications for a quicker response time. The tapered version decreases gradually along the immersion length. Tapered thermowells are designed for use in high velocities, where extra strength is required. Special attention shall be given to the vibration effects caused by the fluid passing the thermowell. The lagging extension commonly referred to as the “T” length is located on the cold side of the process connection and is usually an extension of the hex length. 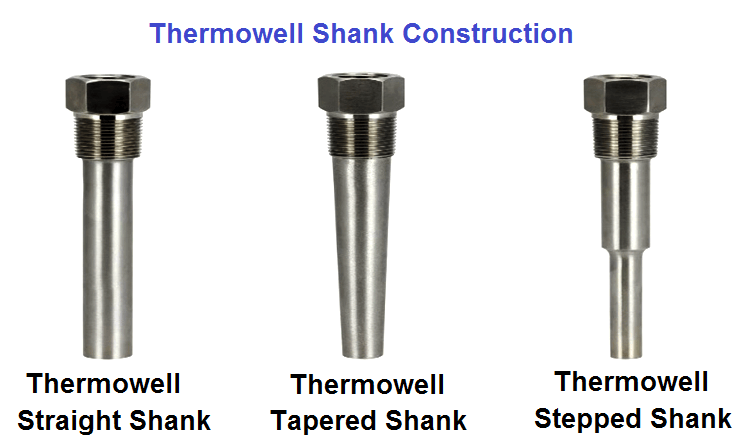 This is the outside dimension of the Thermowell shank and is densest part because the outside surface area is exposed to the hazardous materials of the process. Thickness of the bottom portion of thermowell. Threaded thermowells are used in smaller pipes to measure the temperature of the non-corrosive fluids, the thermowell is screwed in to the pipe. Flanged thermowell has the flanged top end that is connected using nuts and bolts to the pipe. Thermowell has a flange collar that is attached to a coupling flange. This type of thermowells is used when frequent replacement or removal is required. 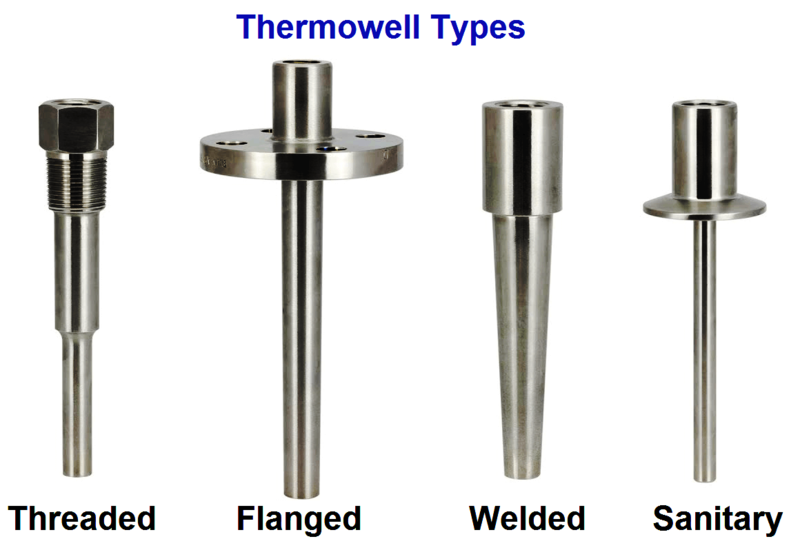 Flanged thermowells are used for high-temperature applications. Welded thermowell is welded directly into the pipeline. As the thermowell is welded into the pipeline it is used for permanent connections. The tip of the sensor must touch the bottom of the thermowell. The temperature sensor such as a thermometer, thermocouple, or RTD is inserted in the open end of the thermowell and typically spring-loaded to ensure that the outside tip of the temperature sensor is in metal to metal contact with the inside tip of the thermowell. The fit of the sensor should be as tight as possible to reduce the annular clearance since air acts as insulator. There is no any standard procedure for selecting the probe length with respect to thermowells. Thermowells are available in different standards with different lengths, the sensor probes such as thermometer, RTD, Thermocouple also available in different dimensions. One has to choose a suitable probe length with respect to thermowell. For example, there are certain cases probe length is less than thermocouple, oil of high boiling point can be put in to the thermowell for heat transfer to probe. It is in low priority measurements. That purely depends upon the application of measurement. In another case, if probe is too much lengthy, it’s stem outside thermowell get bent and chances of physical damage.